Brandie is listed on Best Psychic Directory with Bob Olson with over 60 positive reviews! Brandie Wells, The Compassionate Clairvoyant; Psychic Medium, Animal Communicator, Medical Intuitive, Angelic Healer, Life Coach, Paranormal and Cold Case Investigator. Event/Party Planner. 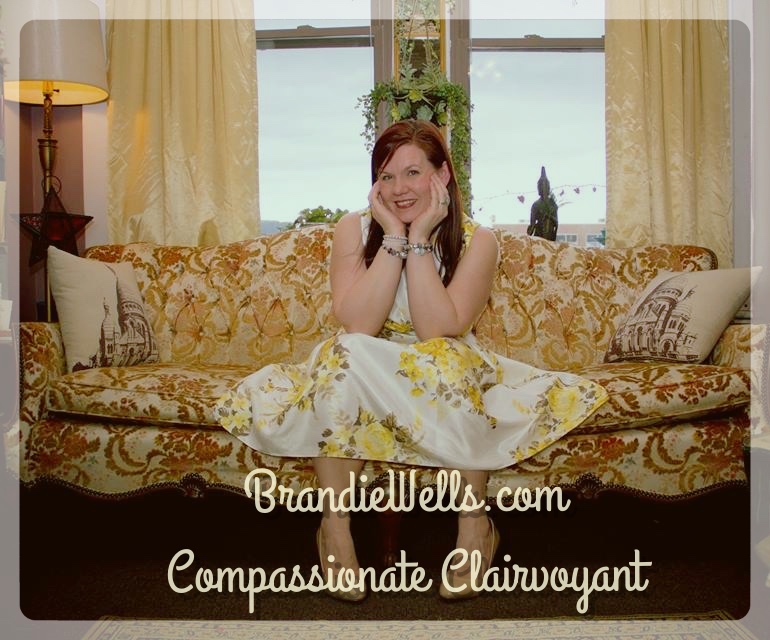 “My name is Brandie Wells, Compassionate Clairvoyant. I am an Angelic Healer, Clairvoyant & Psychic Medium. As a world renowned Psychic Medium and Co-host of Soul Central on ASK1Radio.com, I have expanded on a global level to bring light to the world. Listen every Tuesday at 9:30pm est. Time link© is a process I created through automatic writing. I bring myself to a state of self hypnosis as I ground, clear, open and call in the angels between our souls. You are a field of energy. Through the vibration of your voice, stating your first name, I can hear the low or thick vibrations the angels identify as “areas which need healing”. These areas can be: Messages from past loved ones, financial struggles, difficulty identifying life purpose, relationship issues, etheric cords(your connection to others around you) effecting your energy field, medical/physical needs and more. These messages are “downloads” I receive through automatic writing. Essentially, I am clearing all that no longer serves you to raise your vibrational energy. This brings my clients to a place of abundance in their lives. Time Link© heals the past and reveals the future through spirit guides, angels, past loved ones. Bring your life to higher vibrations by healing your past and revealing the light in your future”. The accuracy in these soul messages is astounding. *IF YOU PURCHASE A GIFT CERTIFICATE, YOU WILL RECEIVE AN EMAIL TO PRINT/DOWNLOAD YOUR CERTIFICATE WITH A CODE. BOOK APT WITH CODE PROVIDED. 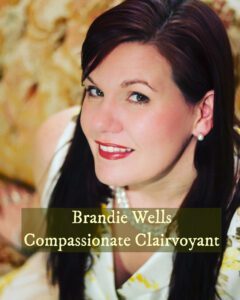 Brandie Wells, Compassionate Clairvoyant is an Angelic Healer, Animal Communicator & Psychic Medium. Brandie is a world renown Psychic and Co-host of Soul Central on ASK1Radio.com. Listen every Tuesday at 9:30pm est. Time link© is the ability to look back and tap into past life energy and mediumship. Mediumship is healing, revealing and creates closure as messages from past loved ones are translated. Time Link© heals the past and reveals the future through spirit guides, angels, past loved ones and intuitive automatic writing. Bring your life to higher vibrations by healing your past and revealing the light in your future. I understand that life events, may at times, make it necessary for you to reschedule your reading or party. You may do so by contacting me up to 24 hours before your scheduled reading or party attendance. In the case of emergencies, either on your end or mine, I will do my best to reschedule you at the earliest available time. I respect your time and will do my best to be on time for all scheduled readings, events and parties. I expect the same courtesy from you. If, for some reason, you don’t show up for your scheduled slot, I will have to consider you a no-show and you will forfeit your payment. There are no refunds for no-shows. By agreeing to use the services/events or likewise of Brandie Wells, via payment or voluntarily, you agree that you have read and understand that all information is subject to the service recipient’s interpretation.Brandie Wells will not be held accountable for any interpretations or decisions made by recipients based on information provided during readings, services or events.These information provided by BrandieWells is for entertainment purposes only. All information and/or guidance given to you by Brandie Wells does not take the place of any medical, legal or financial advice given to you by any qualified professional. All services by Brandie Wells are not a substitute for medical, legal or financial advice.You must be 18 years of age to use this service, or have written consent from a parent or legal guardian. Brandie Wells cannot be held liable or responsible in any way, shape, or fashion for any event that results from use of any information or services provided by Brandie to you, not limited to financial losses or any other negative outcomes. You completely absolve Brandie Wells of any responsibility, financial or otherwise, for how you use the services, the services of its contractors, partners, and preferred vendors. You acknowledge and agree that Brandie Wells does not provide, and does not purport to provide, any medical and/or psychological treatment or therapy. BRANDIE IS NOT TRAINED OR LICENSED AS A DOCTOR, NURSE, PSYCHOLOGIST, OR THERAPIST.In consideration, you covenant and agree that you will forever refrain from instituting, maintaining, prosecuting or in any way aiding or asserting any claim, demand, or cause of action against Brandie Wells, representatives, successors, transferees, assigns, or any parent or subsidiary organization for any injury, disease, physical or mental condition, damages, losses, costs, or expenses of any kind or nature whatsoever arising from or related to your use.Nothing in this Agreement excludes or limits your statutory rights which may not be excluded or limited by law due to you being a member.